LOS ANGELES, Calif. /California Newswire/ — iMobie Inc., an advanced iOS-related software developer, updated iPhone manager AnyTrans with exclusive iCloud management feature to manage and sync contents across multi-iCloud accounts. For the first time, users can view, edit and batch upload/download iCloud photos, messages, contacts, etc. with simple drag-and-drop, remove private info, or even move sensitive data to another confidential iCloud account. Furthermore, it allows users to resume interrupted downloads from iCloud Drive and extract anything they need from iCloud backups. To protect users’ privacy, AnyTrans never retains iCloud content or account info; all operations are encrypted. The innovative multi-iCloud Sync gives you better control over all your iCloud accounts. You can move photos to other iCloud accounts for free storage; integrate scattered data from multi-accounts to the daily-used one; even share iCloud data & files among family members easily. Every iCloud login is protected with the same encryption used by Apple and AnyTrans has no way to decrypt it. To give you better experience with iCloud Drive, AnyTrans allows you to resume interrupted downloads, so you don’t have to re-download completely, saving you much of your precious time. Better yet, you can upload/download files in bulk with drag-and-drop, and no more annoying one-by-one clicks. AnyTrans gives a quick solution to manage iCloud data & files. 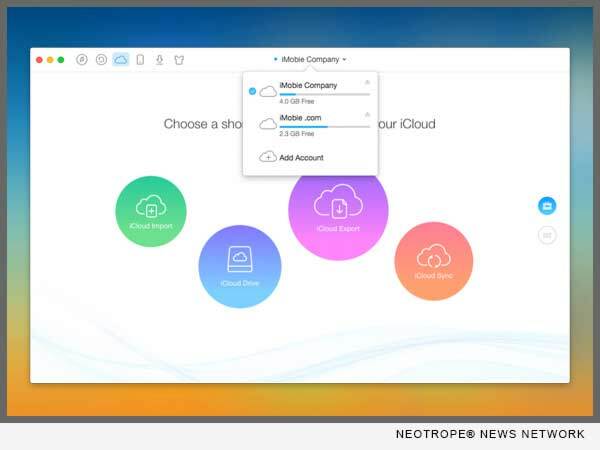 Whether you want to download iCloud files to desktop, add data to iCloud, or edit them, you can instantly do it via an intuitive UI, no need to open iCloud.com website. iCloud backup stores all your iPhone stuff, and if/when your iPhone gets lost, it will be the most reliable – even only available – way to retrieve your important data. With AnyTrans, you can preview data & files in your iCloud backups, and even selectively extract photos, messages, videos or anything you want, without a full restoration.